This entry was posted on 10.1.2015, in Hevoselämää and tagged aktiivisuus, Christian Carde, eversti Carde, hevosenkoulutus, kouluratsastus, lihastuki, ratsastus, tahti, tukilihakset. Bookmark the permalink. Hevosen lihaksisto työskentelee kahdessa työssä, kuten ihmisenkin. Toinen työ on tuottaa liikettä, toinen tukea liikettä ja asentoja. Voidaan sanoa, että on kaksi eri lihasjärjestelmää, tukilihaksisto ja liikettä tuottava lihaksisto. Osa lihaksista tosin osallistuu kumpaankin työhön, osa on enemmän erikoistuneita omaan työhönsä. Eläimenä hevonen on tarkoitettu pääasiassa käyttämään liikettä tuottavaa lihaksistoa. Arki on pääasiassa oleskelua, kuljeskelua ja lyhytkestoista pakenemista tarvittaessa. Hevonen tarvitsee tukilihaksistoaan melko vähän tasapainoiluun, kiipeilyyn jne, jollei se satu elämään esimerkiksi vuoristossa. Toisin mahtaa olla vaikkapa (aktiivista elämää viettävillä) kissoilla tai apinoilla. Luontaisten taipumusten vuoksi hevosen liikettä tuottavaa lihaksistoa onkin suhteellisen helppo a valmentaa ja vahvistaa. Vaikeampaa on saada vahvistettua hevosen tukilihaksistoa ratsastajan painon alla. Hevonen ajautuukin helposti käyttämään liikettä tuottavaa lihaksistoa avittamaan heikkoa tukilihaksistoaan. Asiaan vaikuttaa myös se, että hevonen on pakoeläin, jonka pakovalmius käynnistyy varsin vähästäkin epämukavuudesta. Tasapainon menettäminen – tai pelko siitä – on hevoselle tällainen tekijä. Siksi hevonen, jonka tukilihaksisto ei vastaa asetettujen tehtävien vaatimustasoa, voi helposti jännittyä. Jännittyminen vuorostaan saa hevosen lisäämään vauhtia ja valmistautumaan mahdollisesti tarvittavaan pakoon. Mistä tahansa muustakin syystä aiheutunut pelokkuus tai jännittäminen ohjaa hevosen nopeasti ratsulle epäedulliseen liikkumistapaan. Varsinkin kouluratsastukselle jännityksen ohjaama lihastyö on hankalaa, koska kouluratsu tarvitsisi kaikissa tehtävissään hyvin ja hallitusti toimivaa tukilihaksistoa. Näiden toteutuessa harjoittelu voi johtaa tärkeimpiin tavoitteisiinsa, vapautuneeseen, joustavaan liikkeeseen, kehonhallintaan ja kokoamiseen. Jos perusasioissa tingitään, helposti päädytään tekemään harjoitteet tavalla, joka ei aktivoi hevosen lihastukea. Tällöin liikettä tuottavat lihaksetkaan eivät pysty tekemään omaa työtään vapaasti eikä harjoittelu kaiken kaikkiaan johda kohti tavoitteita. Tanssinopettaja ja koulutettu equiterapeutti Kirsi VanSol on seurannut tiiviisti mm. eversti Carden työtä ja kirjoittanut seuraavan erinomaisen ja helppotajuisen artikkelin, jossa käsitellään juuri näitä asioita ja erityisesti aktiivisen liikkeen ja rauhallisen tahdin tärkeää liittoa. Hänen luvallaan julkaisen tekstin. Why does Colonel Carde keep repeating this mantra? My intention is to make the ideas available to all readers and not give a complete description of the details, so let’s translate the above to the simple, non-scientific terms muscle-training and brain-training. I.) For the sake of clarity, let’s say the horse has two different sets of muscles: the locomotor muscles that propel the horse forward, and the support muscles that provide support, selfcarriage and balance – in essence, collection. As a prey animal, the locomotor muscles are crucial for the horse’s survival – he must be able to outrun predators. The locomotor muscles are therefore generally easy to develop and keep in adequate shape. 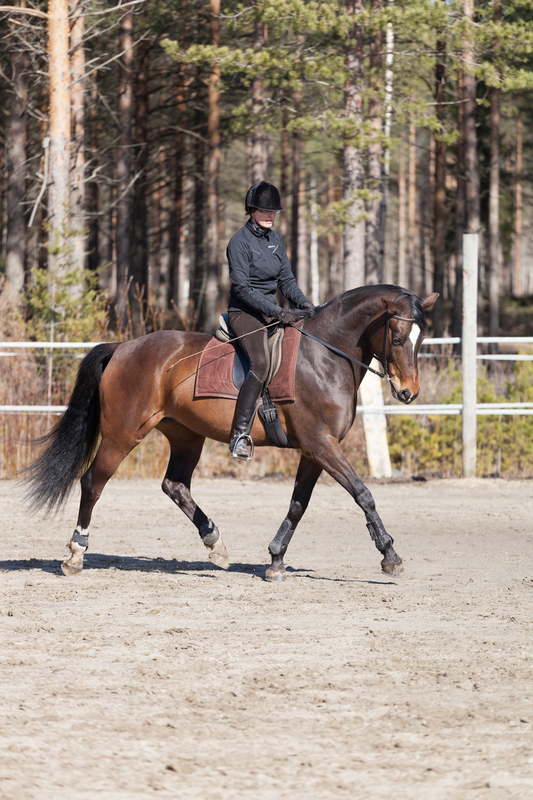 As a riding horse, the support muscles are crucial for carrying the extra weight on his back – this is the tricky part, as the horse was not really created for this. A well-trained, strong and balanced horse with an able rider carries himself in such a way that executing “any movement, at any gait, at any time” is possible. This would be the definition of the ideal, but naturally there are limitations to the individual abilities. Agreed? Without proper collection through the support muscles, the horse cannot perform the movements correctly and is more prone to injuries, in addition to being an uncomfortable ride. In short, the support muscles stabilise the heavy body so that the locomotor muscles can then move it around in the desired manner. The abdominal muscles play an important role as they are mainly responsible for upholding the back. (The first advice you ever get for strengthening a weak or ailing back is to train your deep abdominal muscles!) The hip flexors in turn must be activated to bring in the hindquarters to support the torso. From this, the muscles of the lower back around the lumbar area provide stability to the back, enabling efficient power transmission. Further, the support muscles of the front end provide elevation to the forehand. Often the weakest part of the horse is the chain of muscles behind and under the saddle, especially the abs. Before the supporting muscles have been developed sufficiently with careful exercises, it is not physically possible for the horse to keep the impulsion while maintaining self-carriage. When asked for more than he can perform at the moment, the horse usually sacrifices the collection in order to preserve the locomotion. This can be seen as various forms of evasions. For example: on a straight line, the horse may come over the bit and throw the head and neck up high – in this case, he may be able to keep the rear end together, but “loses” the front end. In another common evasion, the horse escapes behind the bit and becomes front-heavy, losing the rear end instead. On bent lines, he may overbend at the neck laterally, lose the straightness and thus drift outwards. In most cases, the cadence becomes faster as the horse “runs from himself.” This can be interpreted as a form of laziness, as it is much easier for the horse to just run, than it is to use his support muscles and carry the rider. We tend focus on the head and neck, but if you keep an eye on what happens in the horse’s underline and back behind the saddle, you’ll see when he loses the support – well before he gets frustrated and loses his willingness as well. Now, let’s say that at a given moment, the horse has 100 units of “activity energy” at his disposal. These 100 energy units are divided between his two muscle systems, so that when he is in a levade, he is using the units entirely for the support system, with no forward movement. On the other hand, when he is running without collection, he is using most of the available units for the locomotor system. It is the rider’s task to keep the horse in proper balance and allocate the units of activity energy according to the movement. The movements must be performed in a slow enough tempo for the horse to maintain the cadence and the quality, and only be done for a short duration, until proper strength has been built. In this way, the total activity capacity of the horse is increased (building more units) and he can perform on a higher level. 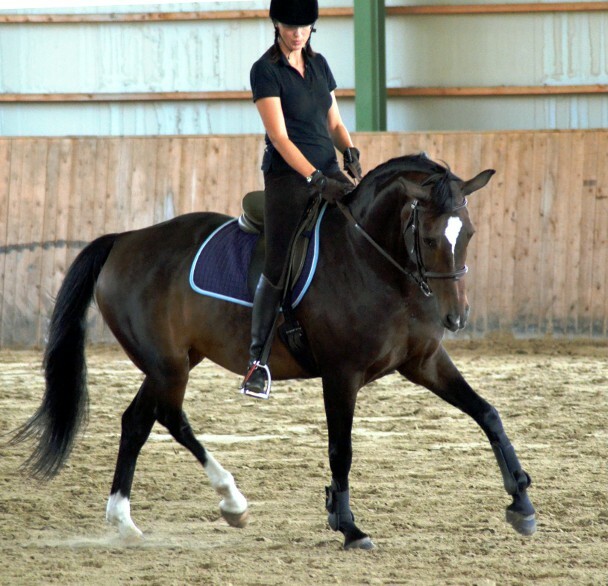 With unwise training, the opposite happens and the horse loses the ability and/or willingness to move. This brings us back to “activity – and slow”: from a muscle-training point of view, it makes no sense to have the horse trot on endless circles, pushing him to go “energetically forward” = fast. This type of training focuses on the wrong set of muscles – the horse will just become more fit for running around. If you plan to challenge a thoroughbred on the racetrack, this is good. If you wish to bring the horse closer to the ideal of being able to execute “any movement, at any gait, at any time”, then ask for activity – and go slow enough so the horse can activate the proper set of muscles! II.) From here, let’s leap to the cognitive-neurological point of view, or the brain-training. I’d like to start with a story of Spanish flamenco. In Spain, there are lots of flamenco guitar players so extremely skilled that they would put any rock guitarist to shame. How do they get that skilled? They start with a simple, short pattern and play it slowly and carefully – over and over again. If they lose the rhythm or coordination, they stop, start again and play it even slower. Once they are able to play the short pattern perfectly, they then gradually increase speed. The next day, they move on to a different piece of music, starting slowly and carefully, and again very gradually increase speed. Their concentration is total; the guitar practice becomes a meditation. With time, they are able to play the most complex, challenging guitar music with incredible speed and accuracy. The secret? They do not practice mistakes. Practice makes perfect, we say. But the brain-training is a double-edged sword, because you will make perfect that which you practice – horses are no exception. If you practice a movement that the horse does not understand or is physically unable to perform correctly, you will create neural pathways that teach the mind and the body to perform the movement in an incorrect way. And if you repeat it over and over again, those pathways develop into habitual responses; the equivalent of four-lane highways between the body and the brain. Completely eradicating the established neural highways is unfortunately not possible. They must instead be bypassed by creating new habitual responses that eventually replace the old ones. Therefore re-training a horse tends to be more difficult than training it correctly the first time. It is up to the human to do the hard work of thinking: prepare, prepare, prepare. Plan the exercise so that the horse can succeed and enforce the desirable neural pathways – thus making the next time a little bit easier. Always be calm, and make sure your horse remains calm. If either one of you is getting frustrated or anxious, stop until you regain calmness. When a mistake happens, stop, think and start again with proper preparation. In this way, you will not practice mistakes, but enforce only those learning steps that lead in the right direction.